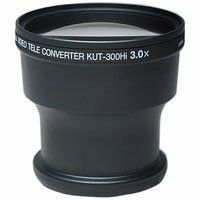 The Kenko KVC-300 Hi telephoto converter brings everything closer. The 3X Telephoto extends the focal length of camcorder or digital camera lenses 3.0 times, bringing things three times as close, throughout the zoom range. This moderate converter allows you to triple the optical range of your camera, and keeps you out of the digital telephoto range where pictures begin to lose resolution and pixelate. Its light weight and small size make this a valuable accessory for added versatility.